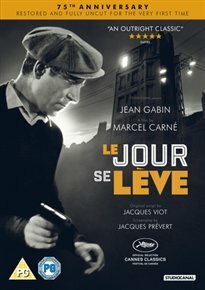 LE JOUR SE LEVE (PG) FRANCE 1939 CARNÉ, MARCEL £17.99Marcel Carné directs this classic French romantic drama starring Jean Gabin. François (Gabin), a factory worker, has love affairs with a flower girl, Françoise (Jacqueline Laurent), and a performer, Clara (Arletty), both of whom have been involved with seedy, older man Valentin (Jules Berry). When the two men come face-to-face a jealous François ends up killing Valentin. As the police close in on him, François barricades himself in a small room, going over the events which led him into such desperate straits.